This new gated 55+ neighborhood located within the award-winning master-planned community of Nexton will provide beautiful, low-maintenance single-family homes and is expected to open in 2017. Del Webb Charleston at Nexton offers homebuyers a lavish clubhouse brimming with world-class amenities for a vibrant atmosphere. Premier builder Del Webb plans to offer 1,000 homes spread across 350 acres of lush landscaping. Active adults love having easy access to the Charleston area as well as everyday conveniences and attractions in Summerville. Current plans call for a 25,000 square-foot clubhouse that will be the community's social and physical hub. This luxurious clubhouse will feature indoor amenities like a state-of-the-art fitness center, gathering room, and indoor heated pool. Residents will enjoy spending time outdoors while staying active. Proposed outdoor amenities are to include a resort-style heated pool, patio, fire pit, and event lawn. Neighbors will be able to challenge each other on the tennis or bocce ball courts. 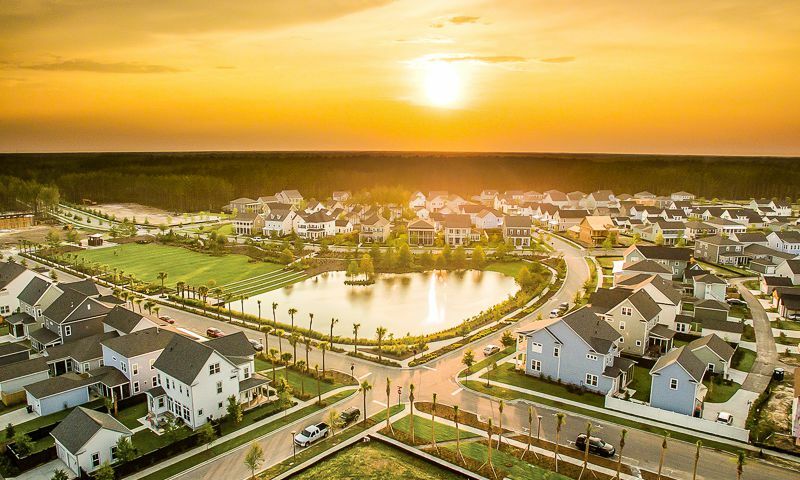 Del Webb Charleston at Nexton will be surrounded by 2,000 acres of open green spaces and 50 miles of walking and biking trails for a truly unique experience. With a total of ten distinct floor plans to choose from within three design collections, homebuyers are sure to find something that meets their tastes and budget. There are three unique floor plans within the Passport Series. These single-family homes range in size from 1,262 to 1,424 square feet. They have two bedrooms, two bathrooms, and an attached two-car garage. These homes feature open layouts, modern kitchens, spacious master suites, walk-in closets, large patios, and optional lofts. Single-family homes within the Expedition Series offer 1,656 to 1,961 square feet of living space. They have two bedrooms, two bathrooms, and an attached two or two-and-a-half-car garage. These floor plans feature gourmet kitchens, inviting gathering areas, dining rooms, and elegant master suites. Active adult homebuyers who want more space can choose from the three floor plans in the Pinnacle Series. These single-family homes range in size from 2,411 to 2,536 square feet and have two or three bedrooms, two or three bathrooms, and an attached two or two-and-a-half-car garage. Standard features include open layouts, gourmet kitchens, large master suites, spacious gathering area, walk-in closets, and outdoor patios. Del Webb Charleston at Nexton will be a social and vibrant age-restricted community. Residents will not only have resort-style amenities but they will also have a long list of clubs, events, and activities from which to choose for a fun and social lifestyle. Homeowners will have opportunities to join groups like card clubs, social clubs, or special interest clubs. The community will also host seminars and guest speaker series that will be an engaging learning experience for all. Organized travel groups will explore other parts of the world for unforgettable learning adventures through the Road Scholar program. Active adults living in this thriving 55+ community will never have a dull moment. Ideally situated in Summerville, SC, residents of Del Webb Charleston at Nexton will enjoy being close to daily necessities and attractions. Easy access to major roadways like Interstate 26 and Highway 17 make driving around town a breeze. Just a few minutes away are several shopping and dining options including Walmart Supercenter, The Home Depot, Lowe's Home Improvement, Target, Kohl's, and Best Buy. The community is just 25 miles north of downtown Charleston for entertainment and cultural attractions. Residents can visit the Charleston Museum, The South Carolina Aquarium, Fort Sumter, Patriots Point, and Mt. Pleasant Memorial Waterfront Park. Medical facilities are also nearby such as Trident Health Systems, Roper Hospital, VA Hospital of Charleston, and MUSC Medical University Hospital. When traveling farther is necessary, Charleston International Airport is about 20 minutes away from Del Webb Charleston at Nexton. Active adults will love coming home to this new 55+ community in Coastal South Carolina. Clubhouse - 25,000 Sq. Ft. - Coming Soon! There are plenty of activities available in Del Webb Charleston at Nexton. Here is a sample of some of the clubs, activities and classes offered here. There are three unique floor plans within the Passport Series. These single-family homes range in size from 1,262 to 2,158 square feet. They have two bedrooms, two bathrooms, and an attached two-car garage. These homes feature open layouts, modern kitchens, spacious master suites, walk-in closets, large patios, and optional lofts. Please Note: Floor plans are not available at this time. Single-family homes within the Expedition Series offer 1,656 to 3,104 square feet of living space. They have two bedrooms, two bathrooms, and an attached two or two-and-a-half-car garage. These floor plans feature gourmet kitchens, inviting gathering areas, dining rooms, and elegant master suites. Please Note: Floor plans are not available at this time. Active adult homebuyers who want more space can choose from the three floor plans in the Pinnacle Series. These single-family homes range in size from 2,430 to 3,810 square feet and have two or three bedrooms, two or three bathrooms, and an attached two or two-and-a-half-car garage. Standard features include open layouts, gourmet kitchens, large master suites, spacious gathering area, walk-in closets, and outdoor patios. Please Note: Floor plans are not available at this time. Love living in Del Webb Nexton! Yes, these are not built by a custom home builder for sure. My experience has been relatively positive. They has come back to address any issues we may have had in a timely manner. I am a retired interior designer so I have pretty high standards. You are buying into a lifestyle first and foremost. Yes, get an independent inspection for your own piece of mine. Great neighbors and lots of activities. Once the amenity center is completed in mid 2019 it will be even better. However, the quality of these expensive homes is consistently very poor. If you buy here, make sure you are prepared for months of contractor re-visits to correct multiple deficiencies. Hire an independent home inspector to protect your interests before you close. 55places.com is not affiliated with the developer(s) or homeowners association of Del Webb Charleston at Nexton. The information you submit is distributed to a 55places.com Partner Agent, who is a licensed real estate agent. The information regarding Del Webb Charleston at Nexton has not been verified or approved by the developer or homeowners association. Please verify all information prior to purchasing. 55places.com is not responsible for any errors regarding the information displayed on this website.